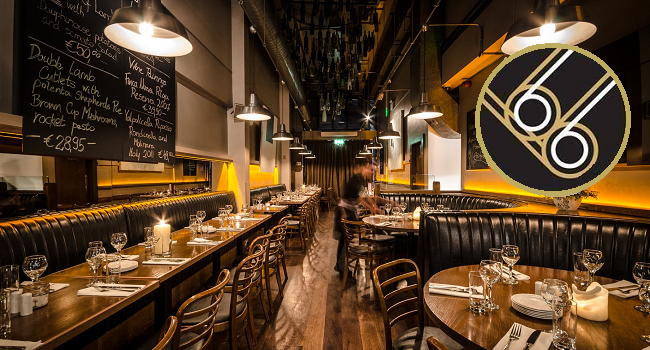 Brasserie Sixty6 has long been known as one of Dublin’s dining hotspots. Todays taste will allow you to have a romantic night out or catch up with friends while enjoying some delicious food, tempting cocktails all in this trendy restaurant. Today, we have great offer for you, enjoy 3 course meal for 2 plus a bottle of house wine and two cocktails for only €60, this offer is available seven days a week until August 31st 2017, please see validity below. The restaurant has expert chefs who use only the finest ingredients, sourced locally from the most reputable butchers, fishmongers, green grocers, artisan bakers, and internationally from carefully sourced specialist food suppliers. Brasserie sixty6 uses only the finest and freshest ingredients in the preparation of their food. The beef served in Brasserie Sixty6 is hung for 21 days for optimum flavour and tenderness, while the poultry is reared on only natural foods, and all fish and seafood is bought fresh – every single day – from the markets. Vegetables come fresh from the markets daily, and are washed and prepared by us in our kitchens. And that’s why the rib eyes, homemade sausages, calamari, succulent chickens, monkfish, Alfredos, risottos, homemade chips, salsas, (to name but a few!) all taste so good! – Available Thursday between 4 – 6.30pm. There is a two hour dining window on these bookings, with the restaurant needing the table back by 8.30pm. – Bookings must be made before 5.30pm on Friday and Saturday, with a two hour seating window.